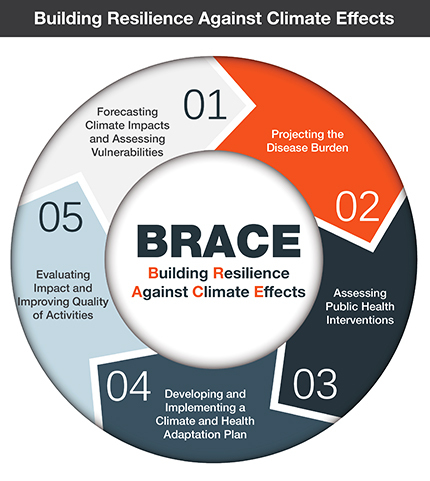 The Florida Building Resilience Against Climate Effects (BRACE) Program is working to improve the ability of the public health sector to respond to the health effects of climate variability by incorporating the best available science into routine public health practice. Climate variability, in combination with a large and diverse resident and tourist population and complex natural ecosystems, influences the health of people in Florida. Temperature, humidity, precipitation, air quality, and the number of severe storms all have direct and indirect effects on human health. 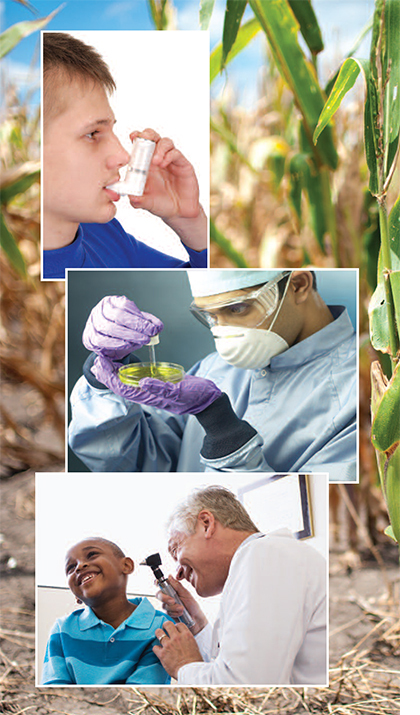 Health outcomes potentially affected by climate include allergies, asthma, cancer, cardiovascular disease, foodborne illness, heat-related illness and death, injury, mental health disorders, stress-related disorders, stroke, and diseases. Some of the environmental risk factors linked to climate variability include extreme temperatures, precipitation, drought, and wildland fires; sea level rise; changes in distribution and habitats; damage to community medical, sanitation, and transportation infrastructure; food and water contamination; and population displacement resulting from changes in the environment. The climate affects all people in Florida. However, health outcomes disproportionately impact certain populations, including children, older adults, those living in poverty, those with underlying health conditions, and those living in certain higher risk geographic areas. And just because an individual is exposed to one or more environmental risk factors does not mean that they will experience a negative health outcome. A number of factors affect risk of disease, and the susceptible or vulnerable populations may be different depending on the climate hazard or health outcome. Susceptibility refers to the internal factors that increase the risk of negative health outcomes. Susceptible or vulnerable populations may be different depending on the climate hazard and/or health outcome. Florida experiences warm annual temperatures that can reach levels harmful to human health and the health effects of temperature are often compounded by the effects of humidity. There are important public health implications from daily and extreme heat. Local and state planning efforts should consider this hazard, so communities can mitigate the risk and adapt to future conditions. Florida is more vulnerable to tropical storms and experiences more hurricane landfalls than any other state. Tropical storms and hurricanes contribute, both directly and indirectly, to a variety of health outcomes. Before, during, and after storms, risks include drowning, injury, carbon monoxide poisoning, and foodborne and waterborne disease.